Coffee Talks and Cat Walks: Sponsor Spotlight: So Chick! Melissa and I share an obsession with sewing. She is an absolute sweet heart. When you're done reading about her below stop by her blog! She is a super crafty lady that I find very inspirational! Enjoy! 1) How did your blog come about? bags, etc; posting was sporadic . In May of 2011, though, I made a commitment to blogging regularly as a way to connect with my readers and now, hopefully, to inspire others to buy and create handmade. I am inspired every day, my daughters inspire me, my family, my surroundings. I am also inspired by many things southern (though I grew up in New York), I love southern architecture and traditions; cities like Savannah, GA and Charleston, SC also inspire me with their timeless grace and charm. 3) How do you spend your free time? 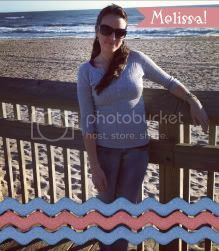 I love to be with my family, I enjoy the beach since we live so close... when I get a chance I'm happy to sit and read a book by a sunny window. Of course, I also enjoy sewing in my free time! I'm currently taking a Free Quilting Lesson as well as working on a smaller quilt for my daughter. I like to set aside time for creative sewing and projects like these. 4) Do you have a shop? If so, please share. The shop will be re-opening on Monday, January 30th.I am currently updating my inventory of fun & fresh handmade handbags & accessories. My items feature fresh fabrics paired with classic/timeless designs. 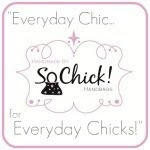 "Everyday Chic for Everyday Chicks!" 6) What word best describes you? One word? Hmmm.... It's way hard to pick one word! I don't generally meet a stranger, I will talk to most anyone that will listen, am passionate about what I love and am happy to share that... So, my word is going to be: Outgoing. 7) If you could share one secret of your success, what would it be? Be aware of your surroundings in your market, but don't get hung up on the competition and don't stray from what is in your heart/what you are passionate about. You should love what you do/the products you create, because if you don't, it will show. You picked a great girl to spotlight! Love Melissa! And check out her shop when it reopens....beautiful products. I'm sure they'll be worth the wait!